Dougal Stevenson was one of the first newsreaders to become a household name across New Zealand. 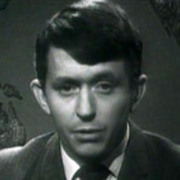 When local newscasting went from regional stations to a nationwide bulletin in 1969, Dougal Stevenson was one of three names who delivered the day’s events via the primetime news. Alongside Philip Sherry and Bill Toft, he was one of the authoritative voices that kept New Zealanders in touch with the world’s goings on. As Stevenson puts it: “When we read the news, that's exactly what it was — it didn’t masquerade as anything else." Despite his tidy image, concisely delivering the day’s events to homes around the country through the compulsory filter of rounded vowels, Stevenson felt like “a small-town boy at heart”. Born in Dunedin, he mostly grew up there, after time as a toddler around Lake Wanaka and Cromwell. Later he went to Otago University. “I spent three singularly unsuccessful years doing law, but didn’t much like it. I was told that consideration of another endeavour might be in order”. Instead, after taking up debating and joining the local drama club, he went in to audition at local radio station 4ZB. Although Stevenson was initially turned away for being too young, his persistence paid off when “in a weak moment they gave in”, and he found himself gainfully employed as a radio announcer, DJ and newsreader. He began hosting Dougal at Dawn, the local early morning radio show. Although after seven months the show was no more, he continued working at the station as a radio announcer. He also began dabbling in TV, doing continuity in the evenings before being told “you can’t do it, you’re not a warm personality. But, would you like to have a go at newsreading?”, an offer he accepted. “I was a much better newsreader than I was a continuity person.” Stevenson also reported for roving show Here and Now, then moved to Wellington, where his first job was on the local edition of Town and Around. He went on to spend six months seconded to Compass. There one particular report he did on the rural town of Patea generated more than its fair share of controversy. “I tried to take an objective look at the community in the 20 minutes I had… The repercussions of that programme were incredible. I was abused and threatened that if they ever saw me in their town again, they were going to tar and feather me. Eventually they calmed down, and finally agreed that my piece was a sympathetic portrait of a struggling community." He continued announcing on national radio, even after returning to television newsreading in the late 60s, this time on the Wellington network news. When the NZBC News broadcast first went nationwide in 1969, Stevenson was the first presenter to read the national bulletin. In 1975, with new competition arriving from TV2, TV One began to allow some of the personality of its newsreaders to show through. One TV One promo made highlighted Stevenson’s long-held love of trail bikes, a seemingly odd hobby for a man whose public persona was so gentle. The move paid off when that year he won the Feltex Award for Personality of the Year, sharing it with comedian John Clarke. To the consternation of many viewers, including the five who rang TVNZ to complain, Stevenson arrived back on screen at the start of 1976 sporting a moustache. This turned out to be a profitable move after its televised removal on Telethon by Roger Gascoigne and Ray Columbus raised $2000. An unsuccessful bid for the moustache to stay on only managed $300. In 1978 TV One sponsored him to travel to the US and the UK, to study and learn from the great international news anchors such as John Chancellor and Peter Jennings. He also witnessed some surprising scenes of director meltdown during a live news bulletin at the BBC. In 1980 TVNZ underwent a restructure, with the national news broadcast being shifted from Avalon in Lower Hutt, to Auckland. Stevenson did not agree with the move, and not wanting to unsettle his family from their home in Paremata, Porirua, refused to relocate. Instead he began hosting car programme The Motor Show, and business show The Money Programme. In 1983 he hosted Antiques for Love or Money, a variation on popular BBC series Antiques Roadshow. On these special interest shows he was a natural fit — he had a long standing love of cars and motor racing, and he himself had been a collector of polynesian and melanesian artefacts since he was young. He was also a host of the Listener Film and Television Awards in both 1988 and 1989, first with actor Kerry Smith and then solo. Stevenson has been known to indulge in a bit of acting himself. In 1977 he played the role of a newsreader in Roger Donaldson classic Sleeping Dogs. Making it, he found that “the newsreader in me actually rebelled … if this was a situation we were in politically, how would a newsreader respond?” Stevenson attempted to convey some reluctance in his performance. He played a ghost in the William Shatner hosted A Twist in the Tale, and in 2004 once again played a news reporter in Otago set drama In My Father’s Den. In 1986 Stevenson was announced as the host of New Zealand edition of UK game show The Krypton Factor. Contestants competed in several different disciplines including mental agility, observation, physical ability and general knowledge. The show ran until 1992, by which time the show’s high-tech futuristic set, and in particular the assault course at the Burnham military camp had become fan favourites. The first season was a co-production with ABC in Australia. Unlike the vast majority of game shows, it had no prize pool. Instead of taking home any sum of money, the show’s eventual winner was awarded a trophy and the knowledge that they’d won. Stevenson returned to radio, presenting Sunday Supplement on Radio New Zealand through most of the 90s. In 1999 he moved back to Dunedin, where he has remained since. In Dunedin he began a decade contributing Notes from the South to RNZ National, which offered his personal view of local events. He returned to local broadcast television in 2006, hosting magazine show Dunedin Diary on Dunedin Television, and continues to act in the local theatre. In 2013 he was a co-host of the series I Was There, which looked back at the history of broadcasting in New Zealand. He hosted the episode on the 1960s, although he says “If I had a time at all, I imagine it was more in the 70s, but I'm very happy and privileged in a way to present this.” In 2012 he was awarded the Queen’s Service Medal for services to broadcasting.